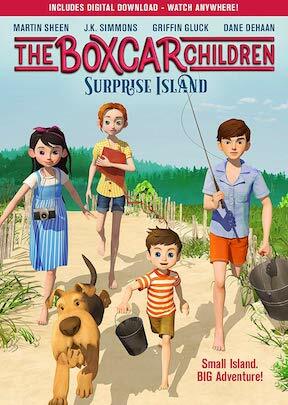 The Boxcar Children: Surprise Island is a fun story of family and adventure. When their grandfather tells them they own a private island and the four children can spend their summer on that island if they want, well, what would you do? Of course these four delightful kids welcome the opportunity to explore and enjoy all the island has to offer. Don’t worry. They are not completely alone on the island. There is the captain of the boat that lives on the island and his new assistant, Joe. The kids enjoy digging for clams, gathering shells, fishing, and swimming while the summer glides by. They also rely a little on their new friend Joe. But there is something suspicious about Joe. He knows a lot about a lot of things and is eager to help the kids any way he can. Yes, there is a mystery about this young man but the truth isn’t revealed until the end of the summer. There are three bonus features on the DVD. The first looks at the making of the film and viewers learn about the author who began the series. She originally wrote the first book to help immigrant children learn the language and included what she thought were the 100 most important words for them to know. The second bonus looks at the music in the film, which the filmmakers wanted to be “dream-like” to reflect the pace of the island. The third feature looks at the folly work, which is how all the sounds in the film are created. Each of these three features is interesting and helps viewers learn more about the movie and making the movie. Also included in the DVD box is a bookmark. Remember, the original author of the book series, Gertrude Chandler Warner, wanted kids to read, so this bookmark is a great incentive. Gertrude Chandler Warner penned the first book in the series, “The Boxcar Children” in 1924. Since then over 70 million books in the series have been sold. There are 150 books about these four children: Violet (voiced by Talitha Bateman), Jessie (Joey King), Benny (Carter Sand), and Henry (Griffin Gluck). The second book, “Surprise Island” was published in 1949 and is now an animated feature film, with Martin Sheen voicing James Alden, J.K. Simmons voicing Dr. Moore, and Dane DeHaan voicing John Joseph Alden. The first film came out four years ago. Francine Brokaw has been covering all aspects of the entertainment industry for over 25 years. She also writes about products and travel. She has been published in national and international newspapers and magazines as well as Internet websites. She has written her own book, Beyond the Red Carpet The World of Entertainment Journalists, from Sourced Media Books.